Over the course of 5 days, the participants were lectured on fundamentals of humanitarian action and humanitarian coordination, humanitarian Civil-Military coordination (UN-CMCoood), including on OCHA’s emergency response tools and services. The course was structured in a way as to ensure constant balance of theory, follow-up group discussions, presentations, team-building, all culminating in practical application through task solving in an exercise simulating a sudden-onset emergency. 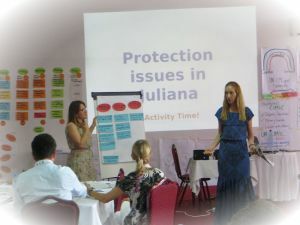 The course was attended by twenty-six (26) participants, out of which sixteen (16) participants represented the DPPI SEE (Albania, BiH, Bulgaria, Croatia, Macedonia, Montenegro, Serbia, Slovenia and Turkey) with another ten (10) participants having been selected by UN OCHA Emergency Service Branch network (European Commission (DG ECHO), Belgium, Italy, Germany and Sweden). 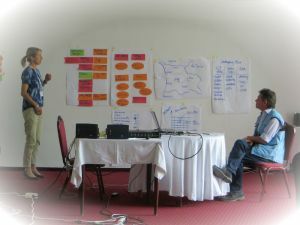 In order to prepare ahead for the course, all the participants had to complete the pre-course training, comprising 4 on-line exercises, over 1 month before the course.